Links to the Past, Places to Visit. In this presentation, I described how within just a few years of their introduction, steam-powered vessels began to challenge the law on the local and regional levels, and shortly thereafter at the national and international levels. Sometimes, this first high technology forced the law to change; and other times, the law held, and forced steam vessels to bend to its demands. Two such examples involved Captain Moses Rogers and the steamship Savannah. In March 1819, they were compelled to bend to the law, as represented by the Fulton/Livingston steamboat monopoly in New York waters, when they departed New York City under sail power. And later that year, after successfully crossing the Atlantic, Rogers and the Savannah managed to force British law to change...slightly...when they convinced the British Treasury to forego charging the normal tonnage duty that any vessel entering a port in the United Kingdom was required to pay. I closed by suggesting that every high technology that followed steam vessels had the same effect on the law: bending to it sometimes, but other times forcing it to change to suit the needs of the new world being created. I'm pleased to report that this presentation sparked a number of interesting questions during the Q&A segment, including the dynamic of State vs. federal regulation, and what "tipping points" allow a high technology to compel a change in the law. In this presentation, I described how—in the wake of Robert Fulton's 1807 steamboat triumph—the spread of this first high technology throughout the various regions of the U.S. was not even. New England, in particular, faced the challenge of possessing mountainous terrain, few long rivers, and dangerous coastlines. Further complicating New England's efforts to introduce steamboat service was the Fulton-Livingston steamboat monopoly in New York waters. I then proceeded to show how New England Yankees adapted in their adoption of this "new mode of transport," by introducing steamers along the margins of their territory, as circumstances allowed. One of the most important breakthroughs occurred in 1819, when New Englander Moses Rogers navigated the steamship Savannah across the Atlantic Ocean. This made it abundantly clear to any skeptics that steam vessels could be safely operated on the open ocean, encouraging further steamer service up the New England Coast to British Canada. I closed the presentation by noting that by 1825—just 6 years after the Savannah's crossing—Bostonians were actively discussing the initiation of steam packet service up the Maine coast and then on to Halifax, Nova Scotia, where they planned to link up with proposed transatlantic steamer service from the United Kingdom. Clearly, New Englanders were leading the charge to think globally when it came to expanding the reach of this first high technology. I'm pleased to report that this presentation generated a large number of questions and comments both during the session in which I presented, and afterward, right up to the end of the symposium. "Steam Diplomacy: Sending a Subtle Message in Leutze's Westward Ho!" In this presentation, I described how a German-American artist named Emanuel Leutze (of Washington Crossing the Delaware fame) was awarded a contract in 1861 to create a massive 20' by 30' painting on the wall of the southwestern staircase that led to the House of Representatives gallery. The main painting was to depict a wagon train of settlers venturing over the Rocky Mountains and into the West. At the bottom would be a panoramic view of San Francisco Bay, as seen from the Pacific Ocean. I then proceeded to show how the first 1861 study that Leutze painted of what came to called Westward the Course of Empire Takes Its Way (or Westward Ho!, for short) depicted only sailing vessels in the distance of the San Francisco Bay panorama, and the second study depicted no vessels at all. I then showed how the ongoing American Civil War, and the disturbingly unstable geopolitical situation (with British Canada to the north of the U.S., and French forces in a bankrupt Mexico to the south) gave both President Lincoln and Secretary of State William H. Seward great concern regarding the security of the far western States of California and Oregon. Finally, I presented the finished Westward Ho! as painted by Leutze in 1862 at the southwestern staircase of the House. This final painting depicted not only sailing vessels in the distance of San Francisco Bay, but most prominently a steamship much closer to the viewer, provocatively steaming right at them! I then explained why I believed— based upon a combination of contextual and circumstantial evidence— that this newly introduced steamship was intended to be perceived as a warship, and a message to the foreign legations in Washington that the United States, deeply distracted though it was by the Civil War, would nevertheless defend the Pacific Coast using vessels powered by the magic of steam. And the person most in need of sending such a message was Leutze's close friend, Secretary of State William H. Seward. I'm pleased to report that even though I presented no direct evidence to prove that Seward was behind the inclusion of this steamship in the final work, at least two-thirds of the audience accepted that the Secretary of State was responsible for its appearance. In this presentation, I began by describing how—in the wake of Robert Fulton's 1807 steamboat triumph—this first high technology quickly conquered many rivers, lakes and bays in the eastern third of the United States. The spread of steamboats was so rapid, that by 1818, its earliest promoters were ready to push much further, and make bold leaps of exploration. In the East, steamboat captain Moses Rogers was preparing to lead a private effort to be the first to cross the Atlantic Ocean in a "steamship." And out in the West, U.S. government officials wanted to organize a public effort to create the first "steam-boat expedition" in history; its purpose was to explore the Missouri and Yellowstone Rivers. The other, composed of a fleet of five river steamboats with a scientific corps under the command of U.S. Army Major Stephen Long, departed from the port of St. Louis and ventured westward, up the Missouri River. While the Yellowstone Expedition found progress with the first high technology very difficult, Captain Rogers and the steamship Savannah succeeded in "discovering" that it was, in fact, possible to safely cross the ocean in a steam-powered vessel. I concluded that the primary reason for the success of one expedition over the other was experience: Moses Rogers was arguably the most experienced steamboat captain alive, and he had ocean sailing experience, as well. That combination gave him the innovative vision needed to design a "steamship" capable of overcoming the many dangers of the sea. I closed my presentation by suggesting that the time-and-space-altering high technologies which followed steam vessels likely had their own early expeditions of discovery, either physical or virtual, and, in every case, psychological. I'm pleased to report that my presentation resulted in a lively Q&A session, and many compliments from attendees. In this presentation, I began by noting that Robert Fulton's creation of the first commercially successful steam vessel in history (i.e., the North River Steam Boat) would not have been possible without the legal and financial support of his partner, Robert R. Livingston of New York. In addition to being a wealthy landowner and one of the more consequential founders of the United States, Livingston was also a Freemason. I then noted how the country's most prominent Freemason, George Washington, served as a positive example for Freemasonry in the early years of the Republic, and especially after his death in 1799. Many young American men wanted to emulate Washington, and joining the Freemasons was one obvious way to do so. Then I introduced the attendees to steamboat captain Moses Rogers, and his dream of building the first "steamship" in history. Among those he recruited to help him was a distant cousin, Stevens Rogers, who was, in fact, a Freemason. Given Steve's humble origins (as a farm boy turned merchant mariner), I suggested that he served as an excellent example of the “egalitarianization” of Freemasonry in the United States at the end of the "Long 18th Century." I closed my presentation by suggesting that Robert R. Livingston and Stevens Rogers were among the vanguard of a large number of Freemasons who contributed to the introduction of additional “egalitarianizing” high technologies over the following two centuries, and that much more research can be done on Freemasonry's role in helping to create the modern high-tech world. I'm pleased to report that my presentation received many compliments and follow-up questions from attendees throughout the remainder of the conference. It would appear that Mr. Donald Canney, the naval historian whom I challenged to a debate based upon his Amazon review of STEAM COFFIN, has, by his silence, declined to accept. And it marks the second time that I have challenged said reviewer to a debate. And it is also the second time that the reviewer in question has declined my challenge. Why won't they debate me? Probably because they know that the evidence I have marshaled is overwhelming: Captain Moses Rogers and the steamship Savannah did indeed break the psychological barrier, and usher in the creation of a second generation of steam-powered vessels, specifically intended for ocean travel. This second generation of the first time-and-space-altering “high technology” (comprised of steam sloops, steam schooners, steam brigs and steam ships) represent the dawn of the first globalized high technology in history. In this presentation, I chronicled the initial (and very necessary) use of sails on the earliest steam vessels, from Robert Fulton's North River Steam Boat to trailblazing imitators on the rivers, lakes, bays and coasts of both the New and Old Worlds. This eventually included, of course, the steamship Savannah. Her transatlantic voyage in 1819 benefited greatly from a full set of sails, allowing Captain Moses Rogers and First Mate Stevens Rogers to use any combination of "sheets" that they saw fit to safely propel the vessel when steam was not in use. By 1820, many "steamboats" no longer needed masts and sails; their energy transition was complete. But for ocean steamers, the transition took much longer. This, I recounted, including the fierce competition between the steamships and clipper sailing ships of the mid-19th century. I closed this portion of my presentation by noting that the transition from natural power (sail) to artificial power (steam, and diesel) effectively took 100 years. — Flettner “rotor sails,” which take advantage of the Magnus Effect. I concluded the presentation by wondering whether we might be on the cusp of a long, slow transition to a mixed-power paradigm for large merchant vessels. I'm pleased to report that this presentation led to numerous comments, questions and compliments both during the session in which I presented, and through the rest of the conference. In this presentation, I recounted the effect of Robert Fulton's first practical steamboat voyages up and down the Hudson River in 1807, and the steady increase in steam service that followed. Just ten years later—in 1817—construction began on the Erie Canal, and I described the indirect effect that steamboats had on the effort, predictably transporting some of the labor, materials and information needed. The Fulton steamboats also efficiently brought upstate plenty of curiosity seekers, who wanted to see the diggings for themselves, and perhaps scope out opportunities that a completed canal might offer. — in 1818, the steamboat Walk-in-the-Water was built on Lake Erie, and began running from Buffalo, New York to Detroit, in the Michigan Territory. From that point on, the uncompleted Erie Canal was already steaming at both ends, providing anyone who looked at a map with a sense of the potential for the completed project. — in subsequent years, additional steamboat service was initiated on other lakes near the new waterway's route, so that by the time the Erie Canal was completed in 1825, it was practically surrounded by steam. I then illustrated how this steaming at both ends, and practically all around, was fully appreciated by keen observers at the time, who noted that it was the combination of the Erie Canal and steam vessels that would serve to transform New York State (and the country). I concluded the presentation by wondering what other great engineering works have been significantly affected by the succession of time-and-space-altering high technologies that followed steam vessels. In this presentation, I sought to analyze, based upon a broad review of surviving evidence, how U.S. Navy officers reacted to the initial generation of steam-powered vessels, with the objective of attempting to discern any patterns to their promotion of, or resistance to, this first high technology. This I did, by first recounting how different naval officers reacted to Robert Fulton's early experiments and ideas, as well as the opportunities for testing that steam vessels offered in the first two decades of the technology's life (i.e., ~1807-1825). This included their reaction to the steamship Savannah in 1819. Then, I placed each naval officer into a matrix based upon both their rank and their general disposition toward steam vessels ("pro-steam" vs. "no steam"). — Junior naval officers appeared more willing to risk supporting this revolutionary technology during peacetime. — Mid-level and high-ranking naval officers appeared more willing to risk supporting this new technology during wartime, especially when they perceived the enemy had the upper hand (as the Royal Navy did during the War of 1812). — The senior-most naval officer in the service appeared reluctant to accept steam-powered vessels, probably in part because if the technology was introduced and subsequently failed, that officer would shoulder the most blame. I concluded by suggesting that each military branch has had similar experiences with different technologies in the 200 years that followed, the most recent example being initial resistance in the U.S. Air Force to the introduction of pilotless drones. I'm very pleased to report that the presentation, which was seen by a healthy mix of Academy midshipmen, historians and other interested participants, generated a very lively discussion of comments, questions and compliments. In this presentation, I described how the first generation of steam-powered vessels created a new kind of mobility for the traveling public. In conjunction with the newfound sense of individual liberty, as espoused by the American Revolution, and carried on by further revolutions in Europe and Latin America, this "new mode of transport" spawned a novel sense of power for anyone who wished to use it. In a phrase, the new "liberté" combined with the magical new "mobilité" to create a new world of possibilities for "humanité." It also served to break down borders. This, I illustrated with a variety of examples from both North America and Europe. Steam vessels proceeded to break down borders not only internally within countries, but internationally, as well, to positive effect. The most poignant example was my suggestion that Britain and France had not fought a war against each other in over two centuries, thanks in part to the introduction of steam ferry service between Dover and Calais in 1820. It also included the effect of the steamship Savannah's crossing in 1819, which spurred the British to strive for transatlantic steam mobility, thereby lessening the sense of border between the US and UK by the 1840s. I concluded by suggesting that each subsequent time-and-space-altering high technology served to increase mobility, and reinforce liberty for all of humanity in its own unique way. I'm happy to report that the presentation was met with kudos and keen questions on how people at the time reacted to this powerful combination of "liberté et mobilité." In this presentation, I described how steam-powered vessels acted as a new kind of revolutionary "bridge" where none had previously existed, or if it did (like a "land bridge"), its pathways (i.e., roads) were so poor as to be undependable. Sometimes, this "steam bridge" was simply a ferry connecting opposite sides of a river or bay, where no physical bridge could then be built. Other times, it connected -- hop-skotch style -- a series of places, such as Buffalo, New York and intermediate stops along the south shore of Lake Erie, ending at Detroit in the Michigan Territory. Then I illustrated how, as the capabilities of this first high technology grew, so did the length of the steam bridges created. This included the potential for an Atlantic steam bridge, as shown by the steamship Savannah's crossing in 1819. I concluded by suggesting that all of the high technologies that followed in the wake of steam vessels created their own kind of "bridge," either brand new or more efficient than any prior connection. I'm pleased to report that the presentation served to jar conference participants, whose perspectives were largely focused on the traditional physical bridge. In this presentation, I described how the first high technology -- steam-powered vessels -- served as an unprecedented and powerful tool for uniting people politically, economically and socially. This I did by focusing upon how steam vessels forged closer ties on a regional, national and international level, in the United States, the United Kingdom and elsewhere. This included the effect of the steamship Savannah's crossing of the Atlantic Ocean in 1819, which spurred the British to catch up to the Americans technologically, and successfully cross the ocean continuously under steam power in 1838. I concluded the presentation by suggesting that the other time-and-space-altering high technologies served to form "more perfect unions" in their own ways, which can serve as fertile ground for additional research. I'm happy to report that the presentation generated a lively discussion and many follow-up questions and compliments. In this presentation, I described the post-Napoleaonic state of affairs in the Caribbean Sea, with South American Patriot privateers (i.e., officially-sanctioned pirates for the revolutionary governments of South America) effectively decimating the Spanish merchant fleet. So successful were the Patriot privateers that they ran out of Spanish targets, and began preying on any merchant vessels they could find (thereby becoming outright pirates). This led to calls in the U.S. for an effective counter-force to the privateers-turned-pirates. Then I noted an attempt to employ the steamship Savannah for just such a purpose, and why this effort to "steam for war" failed. Next, I showed how a number of commercial ocean steamers successfully "steamed for peace," outrunning and avoiding any harm from the pirates of the Caribbean, proving that a steam vessel's speed and maneuverability gave it a clear advantage. Then I illustrated how "steaming for peace" in combination with increased public pressure led to the acquisition of a commercial steam vessel by the U.S. Navy, which converted it into the first armed, ocean-going steamer in the Navy's history, the U.S. Steam Galliot Sea Gull. This vessel helped turn the tide against the pirates, making the Caribbean Sea safe for vessels of all nations. Finally, I closed by suggesting that each time-and-space-altering high technology has experienced its own spaces of confrontation, and that much more work could be done comparing and contrasting how each high technology was used to address each particular challenge. I am pleased to report that the presentation generated an interesting round of questions, as well as kudos. In this presentation, I described the means by which the past is normally taught in the Modern Era, with its focus upon political and social history. I further noted that technological history is almost always treated as an important yet secondary influence over the past 200+ years. Then, I suggested that not only should technological history be given equal billing with political, economic and social history, but that time-and-space-altering high technologies serve as a critically important element for understanding the Modern Era -- so much so that this period in human history could be called the "High Tech Epoch." I then provided numerous examples of how the first high technology -- steam vessels -- served to dramatically alter society on a variety of levels. This included the effect of the steamship Savannah's crossing of the Atlantic Ocean in 1819. Finally, I closed by suggesting that this High Tech Epoch, if incorporated into the existing curriculum, would give students a far better understanding of not only what has transpired during the Modern Era, but what is coming. I am pleased to report that the presentation generated a lively round of questions and compliments. -- a comforting name (i.e., “boats” by definition normally operated in protected waters). -- psychological (i.e., human fear of the unknown). The sum total of these fears represented the challenge of overcoming a perceived “nightmare space” (a “steamship”) operating in an “uncanny place” (the ocean). I then illustrated how Moses Rogers addressed each one of these challenges, and subsequently broke the psychological barrier by successfully crossing the Atlantic Ocean in the steamship Savannah. I'm pleased to report that the presentation resulted in a wave of questions, comments and compliments. This presentation served to complement and extend the ideas I introduced in my talk before the 35th HTA Conference three years ago. For this 38th Conference, I stated that the first generation of humans who used the first high technology (i.e., steam-powered vessels) practically possessed a kind of magical power, which gave them abilities superior to those who continued to travel on water by natural means (i.e., via human-powered oars or wind-powered sails). In other words, people who patronized the steamboats were, at least temporarily, high technology super-humans. Then I noted that the successful crossing of the Atlantic Ocean by Captain Rogers and the steamship Savannah in 1819 represented the dawn of the globalized high tech super-human. -- Are all high technologies (as defined) progress? -- Can a modern person operate effectively without using all of the high technologies available? In this presentation, I described how, in the wake of Robert Fulton's North River Steam Boat success, Philadelphia found itself at a distinct disadvantage. While the city's nearest competitors -- New York and Baltimore -- had extensive water routes upon which to deploy steamboats, Philadelphia had only the Delaware River, which offered transit ~30 miles north to Trenton, New Jersey and ~25 miles south to Wilmington, Delaware. -- They exported entire steamboats by sea (Moses Rogers did this twice, taking steamboats from Philadelphia to the Chesapeake Bay, in 1815 and 1816). Finally, I noted that with the successful crossing of the Atlantic Ocean by Captain Rogers and the steamship Savannah in 1819, other cities began to more aggressively export steam vessel technology by way of the ocean. Nevertheless, during the first generation of steam-powered vessels and thereafter, Philadelphia was second to none in the promotion of this first high technology in history. I'm pleased to report that the presentation was well received by the diverse audience of historians in attendance. Back in 2012, I was booked to speak in Maryland before the annual banquet of the Steam Ship Historical Society of America. I thought I was going to be the keynote speaker. Actually, I turned out to be the warm-up act, to former Maryland Congresswoman Helen Delich Bentley, who was the keynote. She has just passed away. Congresswoman Bentley’s untiring advocacy on behalf of the Port of Baltimore has made it the competitive nexus for trade that it is today. So much so, in fact, that the Port is officially named after her. I sat next to Congresswoman Bentley at the dinner, and told her about Captain Moses Rogers and his time running steamboats out of her beloved Baltimore, and, of course, she learned about Captain Rogers and the Savannah during my presentation, for which she personally expressed her admiration and thanks. I can state that even at 88, she was as feisty as her obituaries claim. Rest in Peace, Helen Delich Bentley. In this presentation, I described in detail how the first steamboat entrepreneurs sought to create new categories of consumers, or dramatically expand existing ones. American owners did so initially by flying coachwhip pennants from their steamboat masts. The coachwhip pennant was traditionally used to signify a government-owned vessel, such as a warship. With the coachwhip, these entrepreneurs were declaring that while their steamboats were privately owned, they considered them to be a form of public vessel. To wit, if you could pay the fare, you too could ride the steamboat. Then I showed how steamboat entrepreneurs built upon this, taking steps to cater specifically to women, those on a tight budget, recreationists, tourists and commuters. The results included the creation of new tourist destinations as well as modern suburbs, all predictably accessed thanks to steamboat service. Finally, I noted that once the steamship Savannah crossed the Atlantic in 1819, the customer base for steam-powered vessels became increasingly global, as it eventually would for the other high technologies to follow. I'm pleased to report that the presentation received both many compliments as well as the largest number of questions for the session. My travel to this conference was made possible by a grant from the Ronin Institute for Independent Scholarship. In this presentation, I outlined the existing structure for describing recent human history: the Stone Age, the Bronze Age, and the Iron Age. While other ages have been suggested (such as the "Information Age"), none of them seem to possess a distinct definition or starting point. Then I showed how steam-powered vessels (including the steamship Savannah) can serve as the clearly-marked beginning of a newly-defined High Technology Age, in which the human race is able to use an artificial power to alter time and space to practical effect. Included within this High Technology Age are the other time-and-space shifting inventions that I have previously outlined, leading right up to the present-day internet. Placed in a timeline with the other well-defined ages, I showed how this High Technology Age could be used to teach students where they fit into the big history framework, and allow them to compare and contrast human development over the past 200 years with prior ages that lasted millennia. I'm pleased to report that the presentation received kudos from the session chair, as well as a number of questions, compliments and comments regarding where the human race goes from here. In my presentation, I stated that prior to 1807, farmers and factors (the old-fashioned name for city merchants who acted as intermediaries in the purchase and sale of commodities) had a very disjointed relationship, due to the uncertain means of getting harvested crops from countryside to city. But once Robert Fulton created the first commercially successful steamboat in 1807, the dynamic between farmer and factor began to change. I then showed how steamboats affected the farmer-factor relationship in a variety of ways, and that these effects were not equal across the United States. Beneficiaries varied, leading to outcomes that pitted passengers vs. cargo, farmers vs. factors, farmers vs. farmers, factors vs. factors, State vs. State, city vs. city, and sometimes river vs. river. I also described how the Savannah River's vibrant steamboat commerce in the late 1810s played an important role in the willingness of factors in the port of Savannah to take the risk of forming the Savannah Steam Ship Company, which built the steamship Savannah. I'm pleased to report that the presentation was well received, and generated a large number of questions and compliments. This conference was predicated upon the 1780 statement by Thomas Jefferson that "we shall...add to the Empire of liberty an extensive and fertile Country," meaning that with the founding of the United States, the Americans were creating a new kind of empire distinctly different from empires past or (at that time) present. Jefferson as well as John Adams used this phrase "empire of liberty" repeatedly. In my presentation, I stated that the "empire of liberty" which Jefferson and others described was clearly based upon a political philosophy, of individual human liberty. Then I suggested that once Robert Fulton created the first commercially successful steamboat in 1807, something very significant occurred: by virtue of its time-and-space altering capability, the steamboat gave individuals a new kind of liberty never before experienced. This first high technology also served to fortify and fuel the growth of the political empire of liberty. As such, the creation of steam-powered vessels (including the first steamship, the Savannah) represented the birth of a new and distinctly different kind of empire of liberty. Then I described how the continued creation of other time-and-space-altering high technologies not only served to perpetuate the high technology empire of liberty, but reinforce and reinvigorate the political empire of liberty, right up to the present day. As such, these represent dual empires of liberty, affecting each other in myriad ways. I'm pleased to report that the presentation sparked a lively round of questions and comments, as well as many compliments. In this presentation, I showed the progression of the relationship between steamboats and the act of fishing, from 1807 to 1821. It began with a widespread belief that steamboats were physically dangerous to fishermen, and continued with the prevalent view by 1817 that the churning paddlewheels of steamboats were disrupting the normal migrations of fish in eastern American rivers, resulting in lower harvests. Then I illustrated how the relationship slowly began to change, when, in 1816, the Fulton-Livingston steamboat franchise of New York announced a one-day, open-ocean "fishing party" excursion by one of its steamboats. Fishing, it turned out, was the secondary purpose; the primary objective was to determine whether the franchise could safely send a "steamboat" across the Atlantic Ocean, all the way to St. Petersburg, Russia. The franchise judged it could not, but they nevertheless had discovered another means of generating revenue for their steamboats. In the following years, "fishing excursions" were advertised, although they were always subject to the weather and sufficient ticket sales. 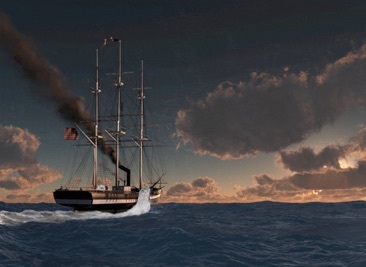 Then I recounted the crossing of the Atlantic in 1819 by Captain Moses Rogers and the steamship Savannah, and how this dramatic psychological breakthrough served to establish the acceptance of steam-powered vessels operating safely at sea. Finally, I showed how, in the wake of the Savannah's voyage, steamboat operators in New York began to advertise regularly-scheduled fishing expeditions on the open sea, in 1820 and 1821. This truly represented the point at which "fishing with steam" on a non-commercial basis became a regular practice -- quite a dramatic change from just a few years earlier. I'm pleased to report that the presentation was well-received, with several fellow historians noting that they previously had never thought to ask the questions answered in my paper. In this presentation, I described how the creators of the first practical steamboats (Fulton, Stevens et al) were clearly both revolutionaries and "innovators." However, once the basic technology was proven, the first generation of steamboat builders became "maintaining innovators," meaning that they had to not only keep their vessels in operating order, but maintain a degree of ongoing innovation to remain competitive with their steamboat rivals. Then I noted that one of these "maintaining innovators," Captain Moses Rogers, became an "innovator" once again, when he created the first "steamship" in history, the Savannah. With their successful crossing of the Atlantic in 1819, Rogers and the Savannah sparked nearly two decades of "innovators" working on steam-at-sea. Once the British ocean steamer Great Western began regular trans-Atlantic service in late 1838, then once again, the "innovators" of steamships became "maintaining innovators." Next, I showed how the sailing world reacted to the challenge of steam-at-sea. Some of these reactionaries decided to compete with steam, by finding innovative ways to make sailing vessels bigger and faster. In their efforts to maintain sail's supremacy at sea, these shipbuilders became "innovating maintainers." The result was an ongoing battle between the "maintaining innovators" of steam-at-sea and the "innovating maintainers" of sail-at-sea, which lasted for much of the rest of the 19th century. Finally, I suggested to attendees that each of the time-and-space-altering high technologies that followed steam-powered vessels have their own stories of "maintaining innovators" of the new technology, as well as "innovating maintainers" who attempted to make the older technology competitive for awhile longer. I'm very pleased to report that the presentation sparked many questions, and received both mentions by subsequent presenters as well as numerous compliments. You can read my brief paper on the presentation here, listed under the first session on Friday, 8 April. In this presentation, I described how the revolutionary time-and-space altering power of steam vessels compelled governments to change the way they operated. I offered three examples to prove this. The first was the steamship Savannah, whose successful crossing of the Atlantic in 1819 practically compelled the British government to acknowledge her revolutionary status as the first oceanic passenger steamer, by partially waiving her cargo tonnage duties (which were normally payable upon departure from any British port). The second example was from 1820, when the Lake Erie steamboat Walk-in-the-Water's rapid movements encouraged her captain to ask that the custom house collectors in her interim ports-of-call (Erie, PA, as well as Cleveland and Sandusky, OH) forego the obligatory arrival and departure clearances, based upon the steamboat's landing only passengers and baggage. This request was agreed to, softening the sovereignty (and revenues) of the custom house collectors in those interim ports-of-call. The third example was from 1825, when Britain's foreign secretary, George Canning, demanded that the United States reciprocate the waiving of general tonnage duties for passenger steamers running between Maine and Nova Scotia, which the British Board of Trade had already approved in 1823. After much back and forth, this was agreed to, thereby beginning the reciprocal softening of government sovereignty by steam-powered vessels. Finally, I suggested to attendees that each of the time-and-space-altering high technologies that followed steam-powered vessels served in their own ways to soften the sovereignty of governments, offering further fields for research. I'm pleased to report that the presentation resulted in a healthy round of questions and compliments. In this presentation, I described how, after the Savannah's epochal voyage, the shareholders of the Savannah Steam Ship Company decided to take up President James Monroe's suggestion to offer this revolutionary vessel to the federal government. To fight pirates in the Caribbean Sea. Then I showed in detail how the resulting political fight resembled a fencing match: the President and both houses of Congress made efforts to promote a purchase of the Savannah (i.e., thrusts), and the Board of Navy Commissioners counteracted to thwart such an acquisition (i.e., parries). Finally, I emphasized the importance of understanding the Navy's resistance to this first steamship, by describing how steam-powered vessels represent the first in a long line of time-and-space-altering "high technologies." I'm pleased to report that, as anticipated, the presentation generated a vigorous round of questions and comments. Maritime historian John Maxtone-Graham passed away on Monday, the 6th of July. He was the author of numerous books, including “The Only Way to Cross” (1972). Mr. Maxtone-Graham was a lineal descendant of General Sir Thomas Graham, Lord Lynedoch, and Robert Graham (later Lord Lynedoch), both of whom traveled on the steamship Savannah during a part of her epochal 1819 voyage. John kindly allowed me to study and quote from a bound volume of letters in his possession that were written by Robert Graham to his mother whilst he and Lord Lynedoch were touring the Continent. These letters included many invaluable descriptions of Captain Moses Rogers, the Savannah, and numerous individuals and places that form a part of the history of the first steamship in the world. Rest in Peace, John Maxtone-Graham. based upon a presentation I made at the 1st Global Conference on Deception, held at the University of Oxford in the United Kingdom last year. In this article, I show how in the wake of the steamship Savannah's successful crossing of the Atlantic, the British government secretly began a three-tiered effort to catch up to what the Americans had achieved. Each effort targeted a different level of steam-powered use on water, from the tactical to the operational to the strategic. Then I describe how the Royal Navy used a form of internal deception to allow it to gain critical ocean-steaming expertise on the back of another ministry's budget. In this presentation, I traced the important roles that three of the State of Connecticut's native sons played in the creation and progression of steam-powered vessels. This began with the experiments of Nutmegger John Fitch on the Delaware River in the mid-1780s. Serving as an important "keystone" was none other than Pennsylvanian Robert Fulton, who, as a Philadelphia resident, was very likely aware of Fitch’s steam-powered paddleboat ideas. Two decades later (in 1807), Fulton's commercially successful North River Steam Boat served as the spark that ignited Connecticut-born Moses Rogers to become one of the first steamboat captains in history. A dozen years after that, Captain Rogers broke the barrier globally, by successfully crossing the Atlantic Ocean with the steamship Savannah. In Liverpool to inspect Rogers' creation was Connecticut expatriate Junius Smith, who made it his life's goal to be the first to cross the Atlantic continuously under steam power. This, Junius Smith achieved in 1838, with the first successful all-steam crossing of the Atlantic Ocean by his steamer Sirius. Finally, I showed symposium attendees how Connecticut's steamer sons served as the vanguard for the creation of a long line of time-and-space altering high technologies. I am pleased to report that the presentation sparked a lively discussion as well as numerous compliments. In this presentation, I described how the first steamboat entrepreneurs publicized and promoted their "new mode of transport." This included examples of paid newspaper advertisements that sometimes sent confusing mixed messages, and other times, with experience, communicated precisely the right "sales pitch" that encouraged ridership. Included in the analysis were the initial efforts to promote patronage for ocean steam travel on the steamships Savannah and Robert Fulton. Then I showed how any promotional growing pains experienced by the first "steamboats" and "steamships" were compensated for by the overwhelmingly positive coverage that steam vessels received from the news and editorial sections of the newspapers. Because these new-fangled "steamers" were providing newspaper editors with the one thing they craved more than anything else faster than they had ever received it before, and that was information. The power of time-and-space altering capabilities combined with editorial approval could not help but quickly boost public patronage of this first high technology in history. I am gratified to report that the presentation was greeted with many questions and compliments. In this presentation, I described how the two revolutions that are included in existing history curricula -- i.e., the Political and Industrial Revolutions -- do not adequately describe what has transpired in the Modern Era. Then I showed that there is a third revolution that should be a part of all Modern Era history curricula, and that is the High Technology Revolution. This third revolution affects both the Industrial Revolution, into which it is commonly lumped, as well as the ongoing Political Revolution. Because these high technologies' ability to artificially alter time and space to practical effect gave individuals a freedom of movement and predictability they had never before possessed. And that led to not only increased efficiency for the Industrial Revolution, but increased demands for more political freedom. Finally, I provided a number of examples illustrating how high technologies have affected both the Political and Industrial Revolutions, starting with the first steamboats, and the first steamship, the Savannah. I’m pleased to report that the presentation generated many questions, connections and compliments. "History of High Technologies and Their Socio-Cultural Contexts"
I also was accepted and scheduled to present at the 41st Annual Symposium on the "exponential transformation of political freedom by the first high technology in history," but logistics compelled me to withdraw. In each of these presentations, as well as others that I have given at additional conferences, I have both defined "high technology" as a time-and-space altering invention and placed steam-powered vessels at the forefront of so-defined high technologies. * This was part of the 24th International Congress of the History of Science, Technology and Medicine. Then I showed how the Presidential Proclamations issued by each president, from Franklin Roosevelt onward, always stated clearly why May 22 was chosen. Next, I illustrated how any mention of the steamship Savannah in these Proclamations has disappeared for the last twenty years. I then described my efforts to have mention of the Savannah reinstated in more recent Proclamations, including my editorial on the website Real Clear History (www.realclearhistory.com) this past spring. (You can read the full editorial here). Finally, I called upon the assembled historians to suggest strategies that could be used to compel a reinstatement of the Savannah into the text of National Maritime Day Presidential Proclamations. I'm pleased to report that a number of interesting ideas were discussed. In this presentation, I showed how in the wake of the steamship Savannah's successful crossing of the Atlantic, the British government secretly began a three-tiered effort to catch up to what the Americans had achieved. Each effort targeted a different level of steam-powered use on water, from the tactical to the operational to the strategic. Then I illustrated how certain parts of the British government used a form of internal deception to allow one ministry -- the Royal Navy -- to gain critical ocean-steaming expertise on another ministry's budget! Finally, I showed conference attendees why this particular example of deception is important, by placing steam-powered vessels as the first in a long line of time-and-space altering high technologies. I am pleased to report that the presentation generated a large number of questions and compliments. I also describe how for many decades, the annual presidential proclamation for National Maritime Day always noted the Savannah’s departure as the reason for selecting May 22nd for this commemoration. Then I show how any mention of the steamship in the proclamation has disappeared, leaving readers of it to wonder why that particular date was chosen. Finally, I call upon President Obama to cure this case of historical amnesia, by specifically stating in the 2014 presidential proclamation that May 22nd was chosen for National Maritime Day because that was the date that Captain Rogers and the Savannah departed on their historic voyage. In this presentation, I showed how the history described in STEAM COFFIN represents a major revision of the prior interpretation of the steamship Savannah and her voyage across the Atlantic. I then noted that in order to stand the test of time, a work of revisionist history must be both thorough and fair, in order to withstand any counter-arguments. Then I illustrated how I uncovered the truth of Moses Rogers’ career and the reaction of various parties to the Savannah, by conducting what I call the multi-angular mining of a wide variety of archival sources, especially at the National Archives and Records Administration (NARA). This means digging not only into maritime and naval records, but also the files of seemingly unrelated departments of the executive branch, as well as the legislative and judicial branches of government. This archival mining method led to numerous discoveries of actions, reactions and relationships previously unknown, thereby providing the proof that the Savannah truly did break the psychological barrier. I’m gratified to report that the presentation generated a substantial number of questions and compliments. Georgia Historical Quarterly is the official journal of the Georgia Historical Society. The review appears on pages 245-248 of Volume XCVII, Number 2. In this presentation, I defined a “natural human” -- psychologically speaking -- as one who accepted that human endeavor and experience were limited by the forces of Nature. Then I showed how the successful introduction of steam-powered vessels, and the crossing of the Atlantic Ocean by Captain Moses Rogers and the Steamship Savannah, proved that humans could artificially alter where they were, and when they were there, to practical effect. This new technology marked the beginning of the post-human, meaning -- psychologically speaking -- someone who readily accepts the magical ability to alter artificially time and space as a normal part of their existence. It also marked the beginning of the ongoing journey into trans-humanism, meaning the transformation of the human race into a hybrid being, part human and part technological. Then, I suggested that by using my previously-described new definition of “high technology,” we can create a basic structure for studying the concepts of post-humanism and trans-humanism. I’m pleased to report that, as anticipated, the presentation resulted in a variety of challenges, comments, questions and compliments. In this presentation, I described how the navies of the world resisted the military implications of newly introduced steam-powered vessels. Then I showed how the successful crossing of the Atlantic Ocean by Captain Moses Rogers and the Steamship Savannah in 1819 served to shock the British establishment: clearly, the Americans were well ahead in developing this new technology. Then, I described the very different reactions of the American and British navies, showing quite clearly how the British government of Lord Liverpool initiated a three-pronged program to catch up to the Americans. And so they did, thanks to the shock of 1819. I’m happy to report that the presentation generated a variety of comments, questions and compliments. In this presentation, I described how Robert Fulton’s first commercially successful steamboat in 1807 did not end the argument as to the practicability of steam-powered vessels. Resistance to their use on larger bodies of water remained. Then I showed how the psychological barrier was methodically broken in the United States (and almost simultaneously in the United Kingdom), by the step-by-step introduction of steamers on rivers, lakes and bays, and then short ocean coast routes. Then I described how the 1819 Atlantic crossing by Captain Moses Rogers and the Steamship Savannah was the ultimate barrier breaker, forcing skeptics to recognize that steam-powered vessels could be used on practically any body of water in the world. I'm pleased to report that the presentation resulted in numerous questions, compliments and connections. In this presentation, I described how at the end of the Second War with Britain (in early 1815), the results of the fighting at sea felt like victory to the Americans, and to the British it felt like defeat. Then I showed how the early U.S. lead in steam-powered vessels gave Captain Moses Rogers and the Steamship Savannah the ability to make the great leap in 1819, and prove to the world that an entire ocean could be crossed safely using the artificial power of steam. I'm gratified to report that the presentation generated numerous questions and compliments. Louisiana History is the official journal of the Louisiana Historical Society. The review appears on pages 105-107 of Volume 54, Number 1. "An invention with the power to alter artificially a person's location to practical effect faster than by natural means." The presentation then illustrated how applying this new definition results in the creation of a new family of high technologies. The progressive introduction of these high technologies, in turn, provides a new and logical structure for understanding the development of technology in the Modern Era. I'm gratified to report that the presentation generated much discussion on the need for greater inclusion of technological achievements within history curricula. "John Laurence Busch has produced the definitive history of the steamship Savannah... Along the way Busch demonstrates the breadth and depth of his research... The book...presents a garden of rich information." New York History is the official journal of The New York State Historical Association; the gentleman who wrote the review is Jacob Ludes III, president emeritus of the New England Association of Schools and Colleges. The review appears on pages 240-241 of Volume 32, Number 2. "Busch...has completed an enviable amount of research, uncovering many new details... The book has something of the feel of a cosy fireside chat about it." The Mariner’s Mirror is the official journal of The Society for Nautical Research. The review appears on pages 374-376 of Volume 97, Number 4.
" 'Her Model is Beautiful': Addressing Fears by Design for the First Steamship in History "
In this presentation, I described how Captain Moses Rogers designed the steamship Savannah not only as a safe vessel, but also as a superior specimen of marine architecture. This latter feature played a significant role in the perception of observers--both American and European--that this steamship was a trailblazer worthy of its accomplishment. As one British newspaper forthrightly declared of the Savannah: "Her model is beautiful." I'm happy to report that the presentation generated numerous compliments and questions. "Steam Coffin...reveals a story of struggle that is both intriguing and historically significant... Busch should be commended for painting a vivid picture of the Savannah's role in shaping the sails-steam paradigm." Southern Historian is an annual journal highlighting the best new articles and books on southern history and culture, and is published by the University of Alabama. The review appears on pages 77-79 of Issue XXXIII. "John Laurence Busch has expended a prodigious research effort..., which offers an engaging account of the Savannah... Steam Coffin...will appeal to the much broader audience of the general reading public." Britain and the World is the official journal of The British Scholar Society. The review appears on pages 154-155 of Volume 5, Number 1. "Steam Coffin is meticulously researched and well written. Busch provides a wealth of detail... An absorbing, recommendable book about an innovation that changed shipping and commerce forever." The Journal of Commerce is one of the leading magazines in the United States for transportation executives. In this presentation, I described the physical and psychological reasons why early attempts to create a "horseless carriage" ended in failure. Then I outlined how the creation of the first high technology (steamboats) and the first globalized high technology (the steamship Savannah) served as logical precursors to all other forms of high technology. This repeated breaking of physical and psychological barriers by steam vessels and other early forms of high technology eventually laid the groundwork for the successful introduction of the automobile in the late 19th century. This was followed by a graph of high technology milestones, which naturally included the automobile. I'm very pleased to report that, as anticipated, the presentation sparked a lot of discussion, questions, debate and compliments. "Why a 'Steam Coffin' Serves as America's Very Own Sea Saga"
Regardless of their purpose, I pointed out that all of these sea sagas shared one important characteristic: the underlying objective was geographical in nature, because our species was limited by natural methods of movement, which left large swaths of the planet unexplored. Then I described how the creation of "steamboats" gave humans their first practical form of artificial movement that was faster than natural means. In a few short years, this led Captain Moses Rogers to create the first "steamship," to prove that this new artificial power could be used to cross entire oceans. As such, the voyage of Captain Rogers and the steamship Savannah represents America's very own and unique sea saga, because its underlying objective was not geographical, but psychological. I'm gratified to report that the presentation generated much in the way of questions, discussion and compliments. "Steam Coffin is the definitive account of the first transatlantic steamship and the mariner who helped conceive and command it... Busch should be commended for his prodigious archival research and imaginative use of sources... Steam Coffin offers the general reader a captivating sea yarn bookended by panoramic descriptions of life and labor in and around the young republic by the sea." Maryland Historical Magazine is the official publication of the Maryland Historical Society. The review appears on pages 382-384 of Volume 106, Number 3. — All of which met the man with a plan, Captain Moses Rogers. Then, Georgia's contribution was clearly placed at the beginning of the line of high technology milestones, which end (for the moment) with the internet. "Busch has masterfully produced a dual biography of both the steamship Savannah and its creator, Moses Rogers... meticulously researched... well written... Steam Coffin is both a great read and a vital reference for serious scholars." The Journal is the official publication of The British Society for the History of Science; the gentleman who wrote the review is Professor Larrie D. Ferreiro, the director of research at the Defense Acquisition University. The review appears on pages 605-606 of Volume 44, Number 4. Two valuable possessions of Savannah first mate Stevens Rogers, which were previously thought lost, have been returned to their rightful owner, the New London County Historical Society, in New London, Connecticut. During the course of my research for STEAM COFFIN, I had asked the NLCHS if I might examine the snuff box which Lord Lynedoch had gifted to Steve during the Savannah's voyage. I was informed that the snuff box, while previously known to have been in the Society's collection, was not listed in a full inventory done in the 1970s, and therefore was considered lost. As my research continued, I discovered that another institution held not only Steve's snuff box, but his spyglass, which had been loaned by the NLCHS many decades ago. (The paperwork for the loan had been lost, not an uncommon occurrence in the curatorial world.) I informed the holding institution that the rightful owner of the artifacts was the NLCHS, but this advisory apparently was misplaced through a turnover in personnel. Upon learning that the artifacts had not been returned, I contacted the holding institution again, and encouraged it to reach out to the NLCHS, which it promptly did. After nearly one-half a century, Steve's snuff box and spyglass are back home where they belong, in the collections of the New London County Historical Society. "With exemplary research, Busch followed an archival trail that led to twenty-two historical manuscript depositories...Equally impressive is his productive research in nearly 150 contemporary newspapers that matches his archival range...All of this, Busch has marshaled into a beautifully written and engaging narrative that places his solidly based factual details within a broad context...John Laurence Busch has made a major contribution to American maritime history with this fine book." The Naval War College Review is the official journal of the U.S. Naval War College in Newport, Rhode Island; the gentleman who wrote the review is John B. Hattendorf, the Ernest J. King Professor of Maritime History at the Naval War College. The review appears on pages 173-175 of the Winter 2012 issue. This article describes the many choices in design and construction that entrepreneurs had to make during the first generation of steam-powered vessels, which can be dated from Fulton’s triumph of 1807 to the early 1820s. Mechanical Engineering is the official magazine of the American Society of Mechanical Engineers. The article appears on pages 36-39 of the January 2012 issue. "The Savannah...was easily one of the most important ships ever built in the thousands of years of maritime history...The modern world owes a lot to Moses Rogers and his colleagues. This big, impressive, informative and entertaining book does its subject justice." Baird Maritime is published by Baird Publishing, one of the world’s premier maritime publishing houses. The review appears on page 41 of the December 2011 issue. "This book is well researched. Busch tracked down a myriad of manuscript sources and consulted over one hundred newspapers from eight countries...The maps are excellent...and nautical terms and activities are explained so that a nonspecialist can profit from the reading." The Journal is published by The Southern Historical Association. The review appears on pages 934-935 of Volume LXXVII, Number 4. "Steam Coffin is a substantial work, a popular history with...helpful end notes and an extensive bibliography...Busch takes the time to develop his story fully...The research is thorough, the writing clean." The Journal is published by MIT Press; the gentleman who wrote the review is Professor Joshua M. Smith of the U.S. Merchant Marine Academy. The review appears on pages 310-311 of the Autumn 2011 issue. In this presentation, I illustrated the ways in which humans accepted for millennia the limitations that Nature imposed upon their ability to change location. Then I described how the first generation of steamboats proved that we could alter artificially our location, and the amount of time it takes to change it, to practical effect. This first high technology accordingly transformed humanity’s conception of time and space, and heralded the emergence—psychologically—of the post-human. By logical extension, the voyage of the steamship Savannah represents the point at which the human race realized they would be able to alter time and space planet-wide, and as such serves as the first milestone in the creation of the globalized post-human. I'm gratified to report that the presentation generated numerous compliments, as well as a request for speculation regarding what might become the next high technology. Naval History Book Reviews is an official publication of the Naval Historical Foundation. The review appears in Issue Number 11. The History Teacher is the official publication of The Society for History Education. The review appears on page 303 of Volume 44, Number 2. An invention with the power to alter artificially a person's location to practical effect faster than by natural means. The presentation then illustrated how this new, additional definition of "high technology" clearly placed a long line of inventions within the meaning of the term. Finally, I pointed out that this new definition also offers the opportunity to create a new framework of high technology milestones, which will aid in the study of all forms of modern scientific and technological history. I'm gratified to report that the presentation received many questions and much curiosity. Nautical Research Journal is the official publication of the Nautical Research Guild. The review appears on pages 127-128 of Volume 56, Number 2 (Summer 2011). Warship International is the official publication of The International Naval Research Organization. The review appears on page 119 of Volume 48, Number 2 (2011). The Journal is an official publication of The Newcomen Society of the United Kingdom. The review appears on page 157 of Volume 81, Number 1 (2011). The review appears on pages 101-103 of the July/August 2011 issue. The Society for Industrial Archeology is a national organization focused upon the study and preservation of the industrial heritage of the United States. The article appears on pages 6-7 of the Summer 2011 issue (Volume 32, Number 1). Seapower is the official magazine of the Navy League of the United States. The review appears on page 49 of the July 2011 issue. The Northern Mariner / Le marin du nord is published by The Canadian Nautical Research Society in conjunction with the North American Society for Oceanic History. The review appears on pages 75-77 of Volume XXI, Number 1. President Obama has cured a seventeen year case of bipartisan historical amnesia by specifically mentioning the steamship Savannah in the 2011 Presidential Proclamation for National Maritime Day. This represents the first time since 1993 that the Savannah has been noted within the text of the proclamation as being the basis for the May 22nd celebration of America’s merchant mariners. In late April/early May, I submitted an opinion editorial to five news organizations, describing this historical amnesia, and calling on President Obama to cure it. All of them declined to publish the op-ed. In any case, mission accomplished. This new, additional definition of "high technology" would place a long line of inventions within the meaning of the term, namely steamboats and steamships, railroads, the electromagnetic telegraph, telephones, automobiles, airplanes, wireless radio, television and the internet. This definition also offers the opportunity to create a new framework for the study of modern history, with maritime history at its foundation. I'm gratified to report that the presentation received many compliments, questions and commentary. The IJMH is the official journal of the International Maritime Economic History Association. The review appears on pages 394-395 of Volume XXII, Number 2. The review appears on page 35 of issue number 67. The review appears on page 55 of the issue (Number 134). Sea History is the official magazine of the National Maritime Historical Society. The article appears on pages 23-25 of the Spring 2011 issue (Number 134). (mt) Marine Technology is the official magazine of the Society of Naval Architects and Marine Engineers (SNAME); the gentleman who wrote the review, Barry Thomas, is a Life Fellow of SNAME and the former chairman of the SNAME History Committee. The review appears on page 78 of the issue. The gentleman who wrote the review, Ira Breskin, is a Mystic Seaport Research Fellow and professor at SUNY Maritime College. The review appears on pages 291-292 of the issue (Volume 49, Number 2). The review appears on pages 321-322 of the issue (Volume 284, Number 5). The review appears on page 81 of the issue (#275). 5) If All Else Fails, Throw Them a Zinger! The presentation was very well received by audience and fellow panel members alike. The review appears on page 39 of the issue. Is it a “boat” or a “ship”? These terms are not synonymous, and the difference in their meanings plays a very important role in STEAM COFFIN. The earlier of the words is probably boat, which comes from the Old Norse word beit, which evolved into the Old English word bāt, and then became boot in Middle English. In each case, these words meant any vessel used to float upon the water. But since the first forays of humans in such craft naturally stayed close to land, a beit / bāt / boot / boat came to denote any vessel used for travel near the shore. But for the Norseman of old, longer voyages upon the ocean—particularly attempts to explore or colonize distant lands—required a different kind of vessel. Such a craft had to be larger and more complex, and therefore required more planning in order to build, equip and man it. In Old Norse, the verb skipa was used to describe the effort to organize and provision such a vessel. In time, this bigger, better-organized craft intended for long voyages came to be described in Old Norse as a skip, which in Old English became a scip, and then in Middle English, a schip or ship. This differentiation in the meaning of the words in Modern English continues to this day. A boat is generally used for travel near shore, whether on a river, lake, bay or along the coast, while a ship is a vessel used for long-distance voyages on the ocean. There is no such thing as a tugship, since those vessels are used only for work near shore. And while there are such things as lifeboats, they are only to be used in emergencies upon the ocean (and hopefully for only short periods of time). Otherwise, the delineation in meaning between the two words is fairly clear. By further example, steam-powered vessels used upon rivers, lakes and bays are “steamboats.” But steam-powered craft intended for long-distance voyages far from land are “steamships.” And therein lays the rub of STEAM COFFIN. Is it a “he,” or is it a “she,” or is it an “it”? Way back in 2002, Lloyd’s List of London, which claims to be the world’s oldest daily newspaper, announced that it would no longer describe vessels as being feminine. Instead of “she,” a vessel would be referred to as “it.” In explanation, Lloyd’s List declared that the paper only wanted to “catch up with the rest of the world,” since most other news organizations already had begun to refer to vessels in the neuter. But numerous institutions, including the National Maritime Museum at Greenwich, England, and the British Marine Industries Federation, and the Royal Navy, insisted that they would continue to refer to vessels in the feminine. Why the resistance to this change? As the U.S. Naval Historical Center in Washington, DC points out, vessels have been referred to as “she” for centuries. The reasons why date back to the Ancient Greeks, who often named their ships after goddesses, in the hope that the honored one would protect their vessel at sea. In other cases, the ship would be named after the departing commander’s wife, to remind him of his loved one while he was gone. More generally, because a vessel served as the only source of protection and sustenance while facing a dangerous ocean, mariners naturally thought of their ships as their mothers, and therefore, as being feminine. Lloyd’s List countered such views by pointing out that vessels are just inanimate objects. "Ultimately they are commodities...not things that have characters," stated the newspaper’s editor. Except when one spends any time talking to veterans of any country’s navy, or merchant marine, or coast guard—what they will tell you is that they felt as though the vessel upon which they served was alive. To them, “it” did have character, and so deserves to be treated accordingly. But once the vessel’s name is invoked, character—real or imagined—is implied, and tradition should hold sway. “Larboard” and “Starboard”? What about “Port”? STEAM COFFIN uses any number of nautical terms, which are all readily defined within the text. Even so, some veteran maritime readers may encounter a few words with which they are unfamiliar. Starboard is not one of them. As any maritime reader knows, this term refers to the right side of a vessel. Because the early craft of Scandinavia were steered by a rudder attached to the right-side of the stern, this became known in Old Norse as the stýriborð, or “rudder side” of a vessel. In time, this word for the right side evolved into stēorbord in Old English, then sterbord in Middle English, and finally starboard in Modern English. Larboard is a different matter. This term is probably a new one for many readers. Once again, its creation can be traced back to Scandinavia. Since the rudder of an ancient Nordic vessel was attached to the right-side of the stern, these ships could not be docked and loaded on the stýriborð (or right side). This meant that the left side of the vessel became, in Old Norse, the hlaðaborð, or “loading side.” In Middle English, it became laddebord, and in Modern English, larboard. This nautical term for “left,” which again refers to the “loading side” of the vessel that faced the “port” when docked, was not in general use in the early 19th century. Mariners—traditionalists that they were—still referred to “left” as “larboard.” Eventually, however, the similarities between larboard and starboard forced a change, brought about in part by a new generation of seamen. In 1844, the Royal Navy officially dropped the use of “larboard” for “left,” replacing it with “port.” The U.S. Navy followed suit in 1846, and eventually, so did the rest of the maritime world. No one should doubt the incredibly powerful impact that the steam engine, and its adaptation for use in steam-powered vessels, has had on the human race. The effect goes far beyond the physical benefit of artificially altering a person’s location and the amount of time it takes to change it. Steam-powered vessels also served to alter the way human beings think about time and place. Even two centuries after their introduction, steam vessels, and their younger sibling, steam-powered trains, continue to exert such an influence that their subtle effects on behavior and language often go unnoticed. Follow STEAM COFFIN on Zvents or facebook. Purchase STEAM COFFIN at Amazon. Purchase STEAM COFFIN at Barnes & Noble. STEAM COFFIN is distributed in North America by Independent Publishers Group. STEAM COFFIN is distributed in Europe by Gazelle Book Services.